(MP186). John Hamilton MC (1919-1993). Oil painting on board. Signed (LR) but not dated..
Standard size: 12 x 16 ins (30.5 x 40.6 cms) approx. 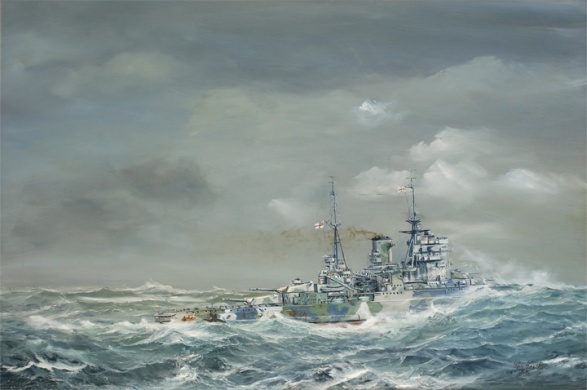 This painting shows HMS QUEEN ELIZABETH in her final guise, having been reconstructed between mid 1937 and early 1941. When first commissioned in December 1914 as the name ship of the class of five, she sported 2 single funnels each of which served 12 boilers; during her 1926-27 refit these two funnels were trunked into one huge one which enabled the new funnel structure to be some 30 feet further from the bridge and control tops which had hitherto been badly smoked out in a following wind. By the time she emerged in January 1941 her final profile showed her with one sleeker funnel, her boilers  now modern and uprated Admiralty 3-drums  having been reduced to only eight in number. There had been modifications too to her main armament of 15 inch guns, the turrets being re-engineered to allow for greater gun elevation; and her secondary armament was entirely new: ten twin 4.5 inch turrets. Improved command and control arrangements, additional radar and radio equipment and a massively augmented light AA armament was disposed around the upper deck. She now carried four aircraft in her two hangars though these were subsequently landed in 1944 when a sufficiency of aircraft at sea could be guaranteed by the additional carriers that had by then become widely available. John Hamilton shows here aircraft still being carried. After noble and hard service in two world wars - usually as a flagship - and during strenuous times in the inter war years too, the end for all the Queen Elizabeths came very suddenly. Returned home from operations in the Far East in July 1945 QUEEN ELIZABETH was steamed up to Rosyth, Scotland and only a month later was paid off into the Reserve Fleet. Three years later she was being broken up, her 33 year career at and end. This successful, famous and much loved ship appears in paintings by a variety of artists throughout this website and with a new QUEEN ELIZABETH recently taken to the seven seas, its a name we will get used to seing again in the Navy List! John Hamilton, an artist widely admired for his accuracy of draftsmanship and the atmosphere of his work , has many oils and watercolours in the collection of the National Maritime Museum and the Imperial War Museum: HMS BELFAST, moored on the Thames in London, exhibits many of the latter's collection. Reproductions of this painting are available either on card or on canvas at variable sizes: the latter is the most satisfactory of the two mediums as the original is a canvas.